A lot of people say that they’d go vegetarian if it weren’t for one holdback: bacon. Yes, bacon might be delicious but there is absolutely no reason it has to come from pigs (or any other animal). Try the best vegan bacon alternatives and you will never miss the real thing again. Best Vegan Bacon Alternatives: Why Do We Love Bacon Anyway? Once you know why bacon tastes so good, you’ll see that it is actually pretty easy to replicate it. The reason we love bacon is because it is loaded with fat and salt. Both are things which our bodies are hardwired to love. As Pulitzer Prize winner Michael Moss talks about in his book Salt Sugar Fat, we are each born with innate food preferences. We love fatty food because it is a good source of energy. We love salty foods because our body needs salt to survive. Remember, when our food preferences were developed in evolutionary history, salt was hard to come by. With about 3.3 grams of fat per slice and a whopping 137mg of sodium, it is no wonder that we find bacon irresistible! When you break it down, bacon is really just a combination of fats, salts, sugars, and amino acids which have been heated. You can easily replicate these components with plant foods. Below are the steps on how to do it. There are a lot of things you can use for your vegan bacon base. Try to choose something which holds together well and has a “meaty” texture. 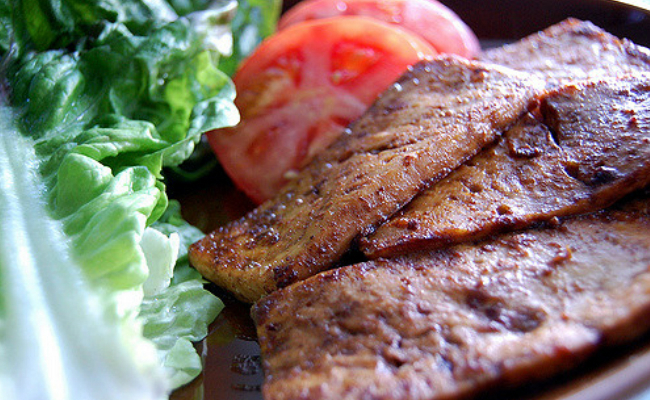 Some of the best options are eggplant, tofu, tempeh, and portabella mushrooms. You can also use crunchy foods as your base, like carrots or coconut chips. As for the fat, the consensus seems to be that coconut oil is best. Coconut oil is high in saturated fat, so it replicates the fat from bacon better than oils like sunflower, canola or olive oil. Don’t worry though – coconut oil mostly contains the healthy type of saturated fat called lauric acid. Maple syrup has a taste that we associate with bacon. You can also use other sweeteners like agave syrup or sugar for your vegan bacon. Soy sauce, tamari, and coconut aminos will all work for giving your meatless bacon the salty taste which our bodies are hardwired to love. Vinegar has an acidic taste which, when combined with the other ingredients, helps replicate the taste of bacon. Vinegar also serves to help tenderize your base. Most bacon that people eat is smoked. You can give your vegan bacon alternative a smokey flavor by adding liquid smoke. Yes, it is a real thing! Living Naturals makes a good liquid smoke that you can buy here for $6.95. To really take your vegan bacon up a notch, also add some paprika and onion powder. Don’t be afraid to get creative! Remember, the individual ingredients don’t matter so much when making vegan bacon. What does matter is getting them in the right ratio. So here’s a recipe for vegan bacon to get you started. Mix all of the ingredients except the eggplant together in a bowl or Ziploc bag. Put the eggplant strips in and let them marinade for at least 1 hour. Put a bit of oil on a griddle and heat to high. Carefully place the marinated eggplant strips on the griddle and let them cook until they have griddle marks. Flip them and cook the other side.